I was talking to several college level teachers this week. The conversation turned to differences between a lecture class and a hands on class like drawing ( or quilting ) and how some of the incoming freshman don’t know how to conduct themselves in a class where there is freedom to move around, talk and otherwise interact with other students and the teacher. 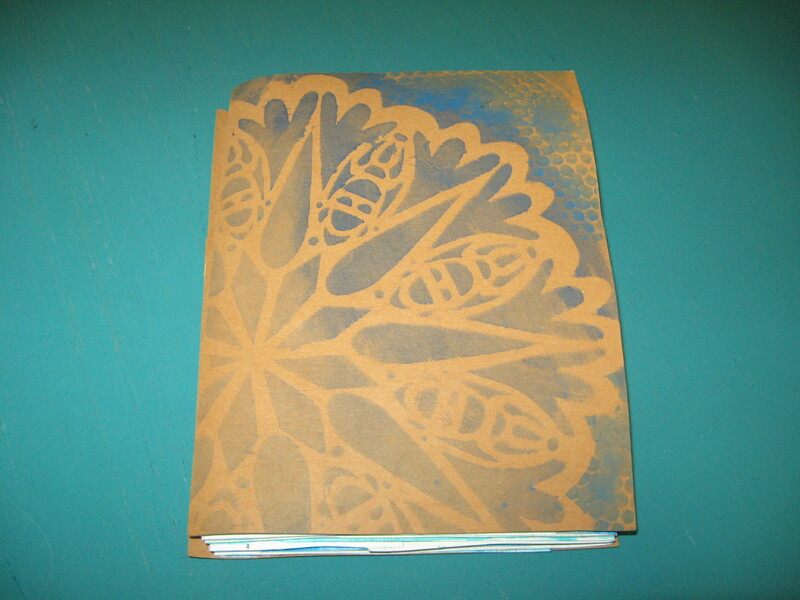 The pre-freshman in the summer course at the School of Visual Arts will be creating accordion folded books during their summer course. Doesn’t that sound familiar. Our course is much less expensive and easier to get to, and beg ins on June 6th. The first Photo is the front cover of the one I’m working on. It is made of KrafTex, and stencilled. 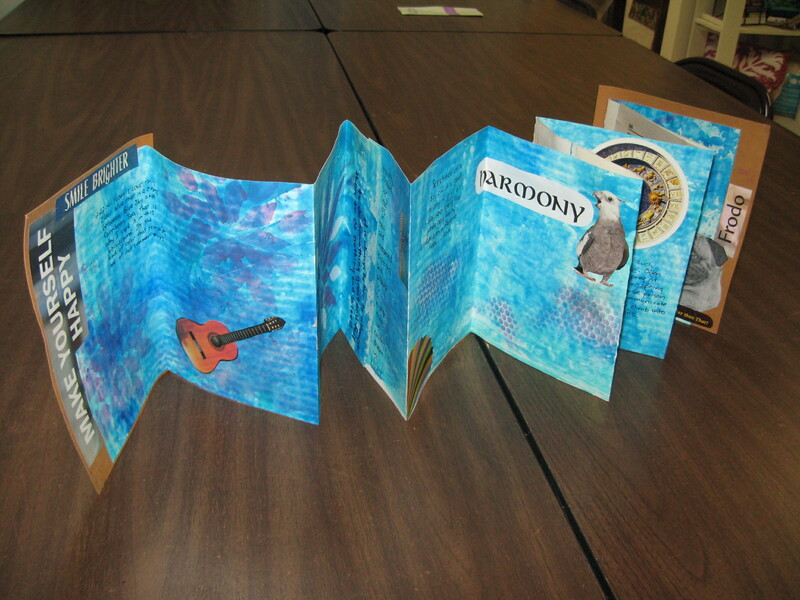 Then you see one side, and the reason it is called an accordion book becomes apparent, the background (Blue ) is various applications of acrylic paint and collage with journaling. It is still in progress. ( A good journal is always a work in progress ) The other side in the third photo is a documentation of our grand opening and ribbon cutting event. This side is built on newspaper clippings. 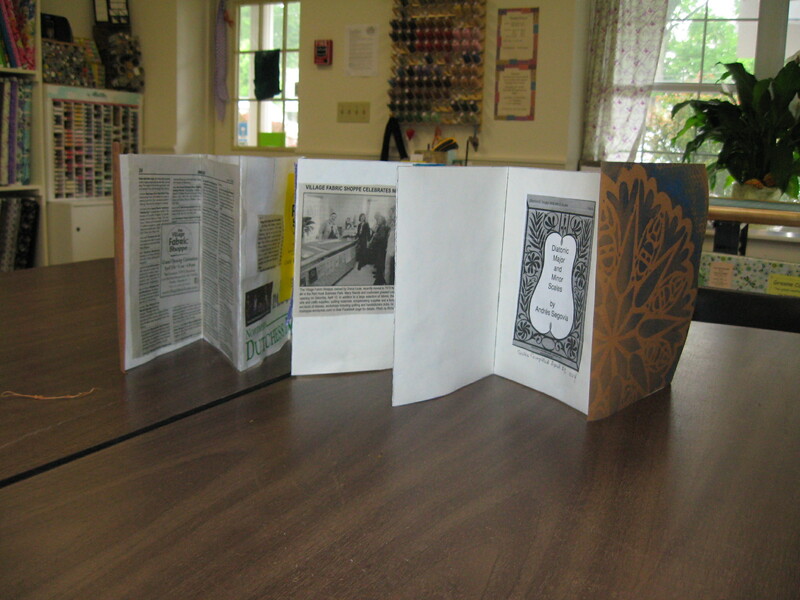 There are 2 things I like about this book structure, first is the way it can stand on a table or mantle, so you can see many pages at once, and the second is that if you want the second side to be very private, you can make a closing where the spine of the book is and keep others from seeing it forever. Ok so back to classrooms, a few guidelines that we came up with that you can review and feel free to share with the students in your life. 1. if possible take classes that interest you. You will enjoy it much more. 4. arrive to class on time, and if you need to bring coffee or water or other nourishment, be discreet about it and have it in a spill proof container. 5. During Class, Be Polite and pay attention to the instructor!!! If your instructor is speaking, do not talk over him or her. You ( and everyone else in class ) are there to learn from that instructor and all the students have the right to hear him or her. If you have something relevant to add or a question, please wait your turn. Many creative people are very disturbed by random background noises, and other conversation irrelevant to the workshop can be a huge problem. This is why longer classes usually have breaks built into them. 6. Turn off or quiet your cell phone and take out the ear buds! and if you do have to take that call do so quietly or excuse yourself and go to another room where your conversation wont disturb others. Once again it comes to the idea that you don’t have the right to interfere with others being able to hear the instructor. SO there you have it, How to get the most out of your class. Before I get back to work, just a few quick reminders, The Village Fabric Shoppe will be closed from the 29th of May through the 3rd of June. Also there is plenty of room in the Friday Journal group that begins June 6th, and May’s meeting of the Explorer’s Club is cancelled since half of our regulars can’t make it. We will pick up exploring how value and color interact at the June meeting which will be the 23rd. Have a great Memorial Day Weekend.